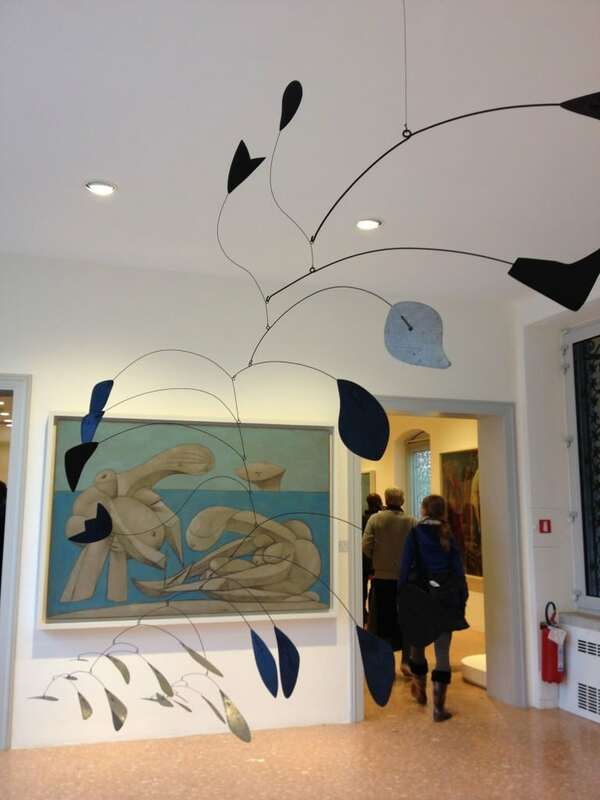 It is customary when in Venice to visit the Peggy Guggenheim Collection and in the eyes of an art student it is essential. Palazzo Venier dei Leoni located on the Grand Canal in Venice is a mysteriously unfinished building which houses the Peggy Guggenheim collection. Rumor has it the façade of the Palazzo would have been much grander but the powerful and influential Corner family living opposite, stopped the building from being completed as they feared it would outshine their own Palazzo. It is also rumored that the garden was once home to a pet lion, which explains the name Leoni (lion). Before Peggy Guggenheim bought the Palazzo and made it her home in 1949, it was owned by the extravagant Marchesa Luisa Castati, who mixed in famous and artistic circles. Peggy grew up in New York during the early 20th century and was the daughter of Benjamin Guggenheim a wealthy American businessman and Florette Seligman, who was eccentric and highly strung. Her father Benjamin was also one of the passengers who died aboard the Titanic in 1912. Peggy began mixing with artists and writers in her youth when she worked at The Sunrise Turn, a bookshop in New York. Here she met Constantin Brancusi, Marcel Duchamp and her first husband Lawrence Vail. Encouraged and persuaded by friends Peggy opened her first gallery in London in 1938 where she exhibited the works of Jean Cocteau and then Kandinsky. After a year Peggy became bored with her gallery and began plans to open a new modern art gallery constructing a new list of artists who would form the foundation of her collection. Even during the war she endeavored to collect one piece of art a day and bought pieces by Braque, Dali and Mondrian. After the war Peggy traveled back to Europe where she exhibited her new collection of art at the Venice Biennale using the Greek Pavilion as a venue. She brought works by Gorky, Pollock and Rothko; the likes of whom had never been seen in Europe before. Is it possible that without Peggy’s support and the exposure she gave them, these artists would not be as famous as they are today? Not long after, Peggy held a show in her garden at Palazzo Venier dei Leoni and then in 1951 decided to open her house to the public during summer so that everyone had the chance to admire her growing collection. Peggy was nominated as Honorary Citizen of Venice after continually supporting and nurturing emerging artists for the thirty years she lived in Venice. She eventually donated her collection to the Solomon R. Guggenheim Foundation, which had been set up by her uncle to manage his own museum. When Peggy died her ashes were scattered in a corner of her garden next to the graves of her much-loved pet dogs.